A thriving world population hit five billion. A gleeful Margaret Thatcher sailed into office, securing her third term as Britain's Prime Minister. 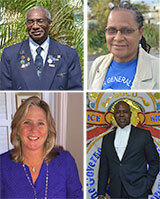 In The Bahamas, a triumphant Sir Lynden Pindling won his sixth, consecutive General Election. 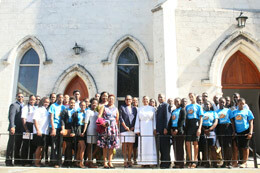 A specially-packaged national park excursion programme for school groups has been launched by the Bahamas National Trust (BNT). 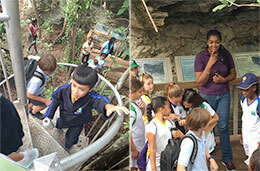 The programme features activities that complement the school curriculum, tailored for each grade level. Special activities will tie in to annual events such as Earth Day (April 22) or World Wetlands Day (February 2). 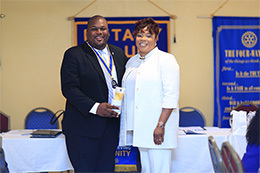 Newley appointed Vice President of BTC North, Eldri Ferguson-Mackey, made her first official Rotary appearance at the Sunrise club on Wednesday morning. Greeting the members, Ferguson-Mackey brought her entire management team to give an update on BTC restoration efforts and supporting ’Service Above Self’ in giving back to the community. 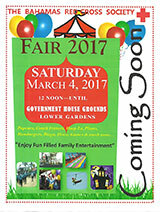 Coming soon The Bahamas Red Cross Society Fair 2017 Saturday March 4th, 2-17 from 12 noon - until at Government House Grounds Lower Gardens. 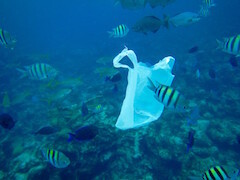 The Bahamas Reef Environment Education Foundation (BREEF) and students of the Eco-Schools Bahamas programme with support from the Lyford Cay Foundation, are tackling a major problem that impacts oceans and shorelines around the world. Two hundred and fourteen students from six schools participating in BREEF’s Shopping Bag Challenge are keeping count of the number of plastic bags that their families get while shopping. 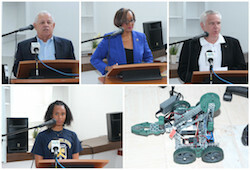 The Rotary Club of Lucaya and its partners have been instrumental in the Grand Bahama Science Club now having a home base that allows for college-level students and faculty to become engaged. 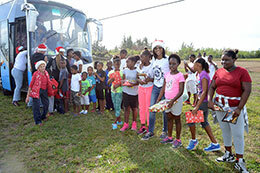 For the third consecutive year, Minister for Grand Bahama, the Hon. Dr. Michael Darville served as Installation Officer for the Grand Bahama Chamber of Commerce’s annual Installation of Officers and Directors. 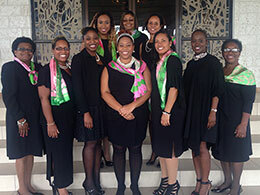 The most recent installation took place February 4, 2017 in the Manor House of the Grand Lucayan. In his short address before installing the newly-elected officers, Minister Darville admitted that the past 13 years in Grand Bahama has not been easy for business owners, but he recommitted himself to continuing to fight for business owners. 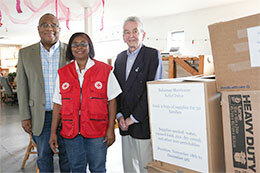 The Grand Bahama Chamber of Commerce (GBCC) made a generous contribution to the Bahamas Red Cross Grand Bahama Centre last month to aid Hurricane Matthew victims and others in need across the island. Back in October, the GBCC launched a relief drive just weeks after the storm, calling on the corporate community to donate essential items like nonperishable foods and toiletries. In keeping with its commitment to open communication, the Grand Bahama Chamber of Commerce's (GBCC) new executive board met with heads of the Hawksbill Creek Agreement Review Committee this month to establish familiarity between the review committee and the chamber's incoming directors. 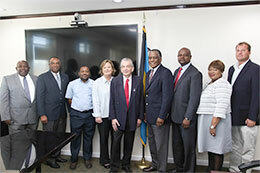 New possibilities and exposure for The Bahamas will be realized with the country’s participation in Expo 2020 Dubai. 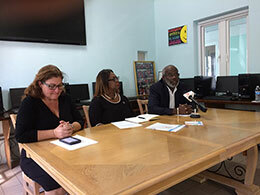 Last Fall, it was announced that The Bahamas would take part in this world fair where 180 countries are expected to showcase achievements of their nations. 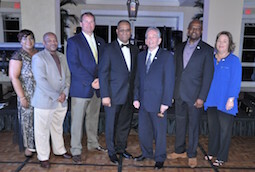 Rotarians from the Rotary Club of South East Nassau heard about the six-month Expo that ends in April 2021 where approximately 25 million visitors are expected to attend. 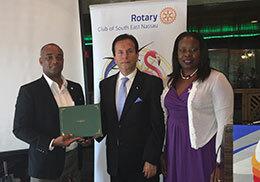 The Bahamas is looking for talent and participation for their pavilion and Rotarians were invited to play a part. On 19 January, 2017, The Rotaract Club of East Nassau (RCEN) hosted its Fifth Annual Entrepreneurship Panel Discussion, under the theme “Entrepreneurship: The Leap of Faith!” at The Nassau Yacht Club. The event was moderated by Patrice “Puppy” Treco Robinson, Founder of Pupstar Entertainment and a proud Past President of RCEN. Patrice “Puppy” Robinson engaged the nearly two hundred attendees in a thought provoking discussion with panelists on the topics discussed. 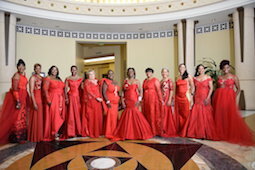 The Sir Victor Sassoon (Bahamas) Heart Foundation and The Heart Ball Committee are accepting nominations for the coveted 53rd Lady Sassoon Golden Heart Award. This award, the people’s award, is presented at the ball to someone who is recognized for Community Work, selflessness, and a promoter of human welfare and dignity, thus making life better for their fellow men. 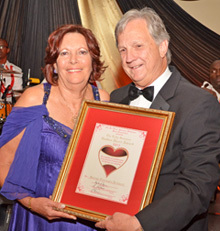 The public can submit nominations accompanied by a letter or statement explaining why the person recommended should receive the award. A select group of 30, comprised of members of the board, management council, volunteers and participants of the 30-year-old programme were in attendance. 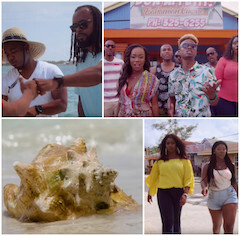 Conch Gone, a five-minute original music video featuring a host of young Bahamian artists depicting a Bahamas without conch has gone viral on social media and will be aired on local television stations. The video premiered recently at the Green Parrot Restaurant on East Bay Street to a standing ovation and loud cheers from a high-level audience of environmentalists and media professionals. It featured more than a dozen performers and was directed by Lavado Stubbs of Conchboy Films. According to one audience member, "The message for the protection of conch was well-crafted and highly entertaining..."
The Zonta Club of New Providence is looking to raise much-needed funds to assist in the construction of the country’s first Transition Home at the Ranfurly Home for children, with a ‘Tapas N Jazz’ event set to entertain and contribute to the cause at hand. 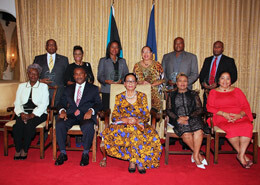 Governor General Her Excellency Dame Marguerite Pindling hosted an Award Ceremony and Reception at Government House, January 12, 2017 for Platinum sponsors of the upcoming Red Cross Ball. 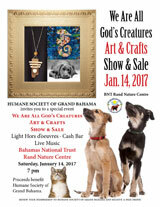 Support the Humane Society of Grand Bahama's special event, "We Are All God's Creatures," which is an art and crafts show with proceeds to benefiting the Society on Saturday, January 14th, 2017 at Rand Nature Centre starting at 7 p.m.
Freeport, Grand Bahama - Santa's Helpers led by Vicky Martel of the Rotary Club of Freeport made their annual delivery to children in West End, Grand Bahama recently.